If you could only have a physical copy of one book, what book would that be? As we’ve discussed previously, I have a love for physical copies of books, even having multiple copies of them. That means that choosing only one book to have a physical copy of would be very hard for me. 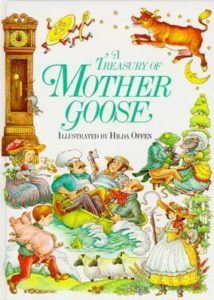 But one of my favorite memories growing up was my grandmother reading to me from a book of nursery rhymes illustrated by Hilda Offen . I actually still have that book, as torn up as it is. So, in the end, I think I would end up choosing to have a physical copy of an illustrated edition of one of my children’s books. That way, I could share the experience of reading it with my daughter. My problem would be choosing which one. If I could find a beautifully illustrated copy of The Wind in the Willows, that is what I would choose. But as it stands, I’ve only ever seen editions that have just a few illustrations. I’m looking for something illustrated to the extent of Jim Kay’s illustrated edition of J.K. Rowling’s Harry Potter and the Philosopher’s Stone. That way I know that the story would keep Millie’s attention. If you could only have one physical book, what book would you choose? Why? Oh man…tough question! I’m assuming that, like the old BBC Radio 4 show “Desert Island Discs”, the Bible and Shakespeare don’t count. Because yeah, I’m not going anywhere without those two. Other than that…tough call. I’m torn between Wind in the Willows (with the original illustrations of course!) and my copy of the collected writings of St Therese of Lisieux, most particularly the Last Conversations. She saw me through the dark night of my particular soul, along with the Bible and Onkel Willy (Shakespeare). I’m quite sure that religious texts should be a given, and since it’s you, I’ll let you have those Shakespeare books too. That’s a tough one. For me it would be between Little Women and From the Mixed-Up Files of Mrs. Basil E. Frankweiler. Oh yes, Little Women!! There was a period a few years back when I was reading either that or Stalky and Co in rotation, for bedtime reading. Nowadays when I get really stuck, it’s the Phryne Fisher mysteries. I’m on my fourth read-through of that series. Great hot-weather reading. I also enjoy The Saint–in the “so bad it’s good” category of purplest prose!